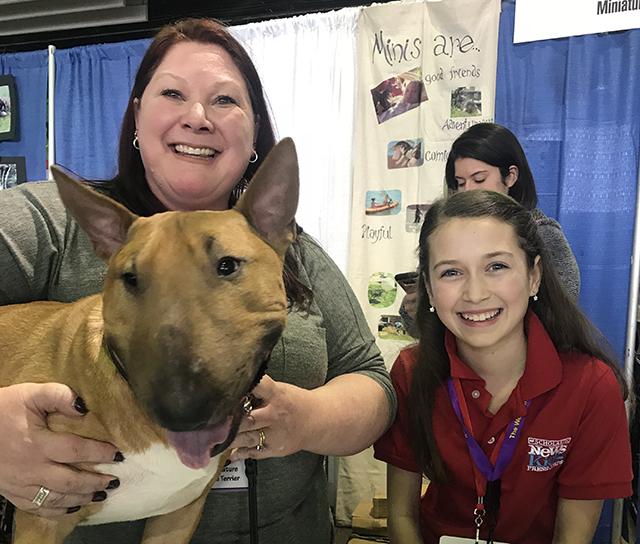 Hounds in Town | Kid Reporters' Notebook | Scholastic Inc.
Click below to see clips from Amelia’s interviews at the Westminster Kennel Club Dog Show. If New York City seemed particularly crowded this week, it was because 2,882 visitors were in town. The visitors were a lot furrier than your average tourists. They were dogs, ready to compete in the 142nd annual Westminster Kennel Club Dog Show. Amelia visits with a furry friend at the dog show. The competition took place on February 12 and 13 at Madison Square Garden. Winners were chosen in each of seven groups: terriers, toy, working, sporting, hound, non-sporting, and herding. The dogs selected as the best in each group moved on to compete for the title of top dog. The dogs may have different ideas about the competition. At a “Meet the Breeders” event the weekend before the judging, Pamela Isaacson of Boston, Massachusetts, spoke to attendees alongside Burton, her Leonberger. Amelia asks a dog breeder what it takes to prepare for the show. The evening of the final judging, breeders and groomers combed and fluffed their dogs backstage. Some pups barked excitedly. Others took a quick nap before showtime. That’s what Benji, a Skye Terrier from Charlotte, North Carolina, did. Amelia at the Westminster Kennel Club Dog Show, one of the oldest sporting events in the United States.